“How fast does my internet need to be to stream?” is one of the most frequently asked questions by those interested in starting to stream. Understanding your internet speed and how it relates to your stream can be a little bit confusing at first. But, once you understand the requirements to stream, particularly your upload speed, and how it relates to the bitrate of your stream, it really isn’t that complicated. 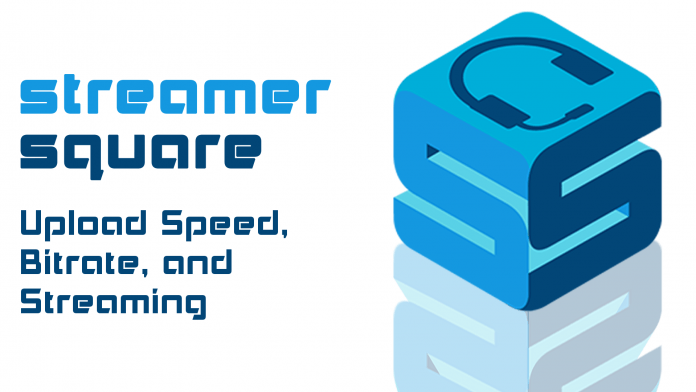 The first thing you need to understand is that streaming means you are uploading your captured video to the internet, so your upload speed, not your download speed, is the important number to look at. Your upload speed is the rate at which you can transmit bits over the internet. Bits are packets of information, in the case of streaming its the stream itself. So, the recommended upload speed is 5Mbps (5000kbps). This speed allows you to stream at almost any quality you wish to, whether that be 720p at 30 fps or 1080p at 60fps. The minimum upload speed is 3Mbps (3000kbps), which will allow you to stream comfortably at 720p at 30fps. Anything less and your stream will pixelate. How do I find out my upload speed? There are no shortage of tools and websites out there that will help you find this out, however the one I recommend is testmy.net/upload. I find it more reliable and accurate than the other sites. Once you have completed your test, click on the “Result Details” tab and the top line of the results is what you are interested in. 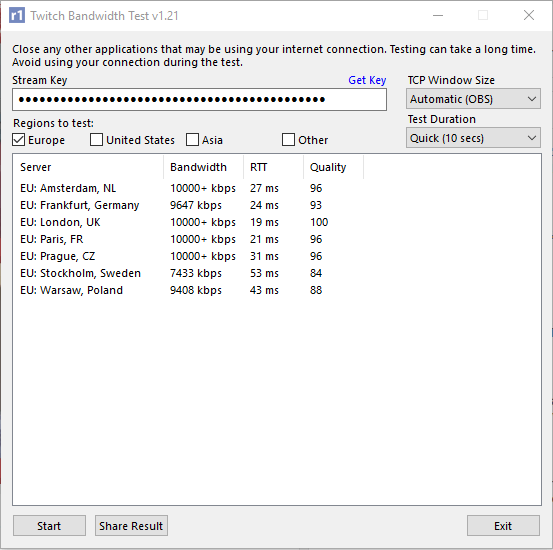 Better than simply just testing your speed, if you are interested in streaming on Twitch I recommend the Twitch Bandwidth Test app. This app not only tests your upload speed to each of Twitch’s servers, but also tests your RTT to the servers and the potential quality of your stream. The RTT is the time it takes to get a response from the server. The quality takes into consideration bandwidth throttling, congestion, and packet loss to give you a number on a scale of 1-100 for your stream on the server. Anything above 80 is good enough for streaming. When setting up your stream you need to set a bitrate, this is the amount of bits you transmit per second in kbps. The greater your upload speed the higher you can set your bitrate, and the higher quality you can stream. So, in theory if your upload is 3400kbps, then should you set your bitrate to 3400kbps? No, your bitrate should never be more than 80% of your the upload speed you got in the earlier test. In reality your upload speed will not always be at that speed, so when your speed drops below that the viewer will experience dropped frames. As a streamer you want to make your stream as accessible to as many people as you possibly can. Currently the global average download speed is somewhere around 5Mbps. By streaming at a bitrate greater than 5000kbps, or even 3500kbps, you are greatly limiting the amount of people who can watch your stream. Even if you have the capability of streaming at a higher quality, doing so is not necessarily the best option. 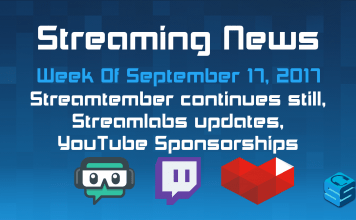 Sites like Youtube Gaming and Beam.pro offer transcoding, or quality options, to partnered and non-partnered streams. This means that even if they can’t watch on source, they can decrease the stream quality to a resolution they can. However, sites like Twitch and Hitbox only offer transcoding options to partnered channels and a limited number of non-partners. As a new streamer or a non-partnered channel, choosing to stream at lower bitrate would be a wise choice. It costs streaming sites lot money to run the servers for streaming, as such they will often implement a maximum bitrate. Exceeding these maximum values may not stop you from going live, but it can flag tracking systems. You may just be asked by staff to decrease your bitrate or in some cases, your channel could be automatically shut down. In conclusion, in order to stream you ideally want to have an upload speed of 5Mbps, at the very least have 3Mbps. These speeds will allow you to transmit a visually pleasing stream, without dropping frames. When selecting your bitrate, you should always remember to never have it higher than 80% of your upload speed. Do what you can to make sure as many people as possible can watch your stream, whilst not sacrificing too much quality.